FARRELL JOHN THOMAS 1926 - 2019 Passed away peacefully 30th March. Loving husband of Gloria (dec). Dearly loved Father to Wayne, Rhonda, Brett (dec) and Robert. Father in-law to Betina, Harry, Julie and Avril. Cherished Grandad of 10 and Great Grandad of 11. Out of all pain now Dad, our memories will be kept close to our hearts forever. Special thanks to the Silver Chain and Murdoch Hospice. The Funeral Cortege for Mr John Farrell of Rockingham will arrive at PINNAROO Valley Memorial Park, Whitfords Avenue, Padbury at 10am on MONDAY (8.04.2019) for a Cremation Service. Fond memories of a much loved brother of Shirley, uncle of Julie and Stephen. RIP Jack. Loving memories of Jack. 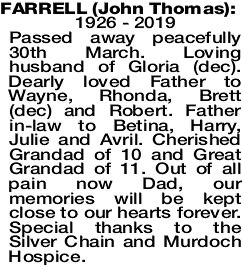 Dear brother, brother- in-law and uncle of Barbara and Charlie (dec), Kelvin and Lyn, Jocelyn and Doug, Mandy and Gavin and families. Our heartfelt sympathy to all the family. 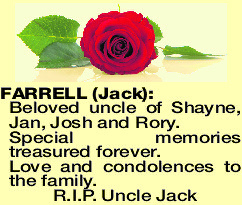 FARRELL JACK Beloved uncle of Shayne, Jan, Josh and Rory.